Darren came through the youth system at Watford, making his debut at the end of the 1989-90 season as a winger. He also played as a striker and full-back in ten years at the club, making nearly 300 appearances. Now living and coaching in New Zealand, Darren spoke to Watford Legends in 2008. Hi Darren. What can you remember about becoming a Watford player. I was from Northampton and came for a trial when I was 14. Tom Walley was the coach then and he liked me. I signed on schoolboy forms that week. I travelled up and down by train, and when I turned 16 they offered me YTS terms. I worked on that until I was 18 and then signed my first professional contract. I made my debut whilst I was still a trainee, which was good. It all went from there and I ended up being there for 10 years. Do you have any games for the club that stand out? Obviously Wembley is the stand out game, and just so happened to be my last game for the club. My individual highlights would be the away game at Southend where I got the hat trick, and the game against Blackburn when I got a couple, playing against Kenny Dalglish’s Blackburn, Kenny was my hero growing up, so that was a nice one for me. Lawrie McMenemy was there that day, and it was good that I got a couple of goals as they earned me a cap for the U21 side. I came on as a sub against Hungary and I was very proud of that. Who were your mates at the club? It always changed as footballers move around, but I am still good friends with Gary Porter, Nigel Gibbs and Richard Johnson. Johnno lives in New Zealand now, so I see a lot of him. We saw you back at The Vic recently in our game against Wolves. How did you enjoy that? It was my first time there in over 4 years. The club looked after us very well, and I got a nice reception from both sides. Why did I leave! I get that asked a lot. Watford had let my contract run out, which was down to the club. Graham and I had agreed to assess the situation at the end of the season. I heard that a few clubs were watching me with a view to getting me on a Bosman deal. Then we won seven out of the last eight games and we went up. If I had been offered a contract I would have signed anything at that point! I got contacted by Wolves and went to see Colin Lee, who had given me my debut, so out of respect to him went for a chat. I travelled to Molineux. I wouldn’t say I was blown away but I was very impressed with the set up there. They also offered me a very lucrative contract. I had been at Watford for ten years and felt it was time to go. 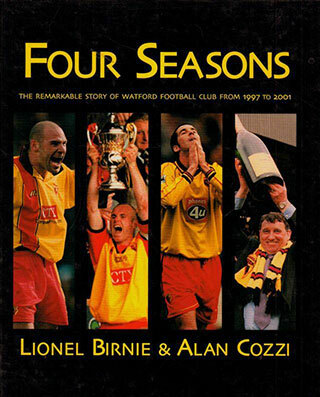 It also felt right to stay at Watford as we had been promoted. Wolves offered me a four year contract which was a great security. I was 27 and it was a great deal for me and my family. It was difficult though to work hard to get in to the Watford side, and then work hard to get promoted, and then leave. I also felt that if I joined Wolves, although Watford had got to the Premier League, I could get to the Premier League and have a better chance of staying there. I wasn’t to know that with Watford it was my one and only chance to play in the top flight. I sat down over a pub lunch with Graham Taylor last week. We had a few glasses of wine and discussed it then, so I’ve talked about it a lot. If you had the same decision to make again tomorrow, what would you do? I would make the same decision as one one hand I got the opportunity to play for a big club like Wolves, whilst on the other hand it set me up to to do the rest of the things I have done in my career so far. And then to New Zealand via Walsall?! I had a couple of problems with my knee at Wolves and ended up out of the side, and Dave Jones came in as manager and brought in his own players. So I went over to Walsall and met a player from Leeds, Danny Hay. I used to sit in the corner of the dressing room with him and Steve Corica, who was an Aussie, and we used to talk about Australia. Steve went over to New Zealand and I was invited over to take a look. The league wasn’t ready to be set up so I played on for another year at Walsall. We went back to New Zealand and loved it there. My wife and I had always said that we would like to go abroad at some stage and we always thought we would go to Portugal. The standard in the Australian A League is like League One here. I played for the New Zealand Knights for two years. We finished bottom both years as the club was not run very well. The club moved to Wellington to become the Wellington Phoenix. But that is a 10 hour drive away, so I then went to a semi pro sort of level, where I played for Waitekere United. And what’s the day job now? Whilst here I got involved with the equivalent of the FA over here, and it is run by Keith Pritchett, who you will know at Watford. We got introduced and after I finished playing I applied for a job as an Area Coach for United Soccer One. And this is what I do now. When I coach I look out for kids who have potential to make it in better leagues, and this is why I was back in the UK – we had six kids who are talented, and we took them to Aston Villa to see if they might be able to join their academies. It was actually through Graham Taylor that we managed to spend some time there. There are some good players in New Zealand but there are no real pathways to professional football. Will you settle in New Zealand now? Yes, we’re resident now. And our kids who were born in Watford General refer to themselves as Kiwi Kids. My wife has a job in the local school and we’re really settled. That’s good to hear. Good luck with the future. Thanks a lot. All the best to you and Watford. Someone who can cook and swim!